In December 2017 the US federal corporate tax rate on profits over $10 million was reduced from 35% to 21%. This column examines the plausibility of the Council of Economic Advisers’ estimates of how a cut in the corporate profit tax rate would boost average household income, and argues that three other features of the corporate tax regime and the wider economy are central to determining the effects of such a cut: the deductibility of capital expenditure and of interest payments from the corporate profit tax base and the impact of the corporate tax cut on private and public consumption demand. In a recent paper we discuss the contrasting views of these two prominent economists, Kevin Hassett and Larry Summers, and try to determine which is likely to be closer to the truth (Buiter and Sibert 2018). We find that two other features of the corporate tax regime are central to the determination of the effects of a cut in the corporate profit tax rate. These are the deductibility of capital expenditure and of interest payments from the corporate profit tax base. The December 2017 corporate tax reforms raised, for a period of five years, the first-year bonus depreciation percentage for capital expenditure from 50% to 100%. Unlimited interest deductibility was changed to net interest deductibility up to 30% of adjusted taxable income, with any excess carried forward up to five years. In recent publications, the Council of Economic Advisers (CEA) (2017a, b) argues that reducing the federal corporate tax rate in the US from 35% to 20% would increase average household income in the US by, very conservatively, $4,000 annually and possibly by as much as $9,000 annually. The idea is that a lower tax will result in higher investment, and thus a higher capital-labour ratio and higher real wages (see also Hassett 2017). Since then, the corporate tax rate has been reduced to 21%. As most of the debate was based on an assumption that the new tax would be 20%, that is the number we focus on in our calculations below. Assume the cut in corporate tax rates from 35% to 20% is likely to cost around $200 billion a year in the short run. This estimate is from the Committee for a Responsible Federal Budget (2017) and is also the number used by Summers (2017a, b, c) and Furman (2017).2 Many estimates are lower – ranging from a short-run one-year revenue loss of $120 billion (Hodge 2017) to $150 billion (Joint Committee on Taxation 2017) – and would make the wage gains relative to the tax revenue loss look even bigger. There were about 154 million workers in the US economy in October 2017, of whom about 127 million were full-time employees.If total employment is what the average wage income increase applies to, a long-run rise in the average wage income of $4,000 dollars – the conservative case – means that aggregate annual wage income would, in the long run, rise by $600 billion, or 3.0 times the short-runloss in tax revenue. In the optimistic case where average household income rises by $9,000, the long-run increase in aggregate annual real wage income would be $1,350 billion, or 6.75 times the short-run annual loss in revenue. Summers (2017a) uses the $150 million number in his calculations. If only the full-time employed workers benefit from these increases, aggregate wage income would rise by $508 billion in the case of a $4,000 wage increase per worker (a multiple of 2.54 of the short-run annual revenue loss) and $1,143 billion in the case of a $9,000 wage increase per worker (a multiple of 5.72). The CEA/Hassett numbers, however, do not refer to average individual worker income but to householdincome. In 2016 there werealmost 126 million households in the US.Working households, those with at least one working adult, numbered close to 111 million. We use the household numbers to calculate the multiples. With are 126 million households, this gives a multiple of 2.52 in the case a wage income gain of $4,000 per household and a multiple of 5.67 in the case of $9,000 per household. With 111 million households, this gives a multiple of 2.22 in the case of $4,000 dollars per household and a multiple of 5.00 in the case of $9,000 per household. The multiples we have computed – the ratio of long-run labour income gains to short-run revenue loss or the ‘dynamic-static Furman ratio’ – are shown in Table 1. Our question is: how plausible are these numbers? We consider only the impact of the proposed corporate profit tax cut rate from 35% to 20% and the expensing of investment and interest deductibility. We first address the issue assuming a constant real interest rate. This would be the case in a small economy with an open capital account or in a closed economy with a Ramsey-type representative consumer where the (long-run) real interest rate equals the subjective discount rate, assumed exogenous and constant. To make the analysis appropriate to a closed economy or to a large open economy, we then endogenise the real interest rate by considering a Yaari-Blanchard overlapping-generations model. In Buiter and Sibert (2018) we show that if the real interest rate is exogenous and there is no expensing of investment and interest, then the CEA’s proposition that a cut in the corporate tax rate increases long-run labour income is qualitatively correct, but the numbers in Table 1 greatly overstate the magnitude of the ratio of long-runlabour income gains to the short-runrevenue loss of a corporate tax cut. Even the ratio of the long-run wage gain to the long-runtax revenue (also called the ‘dynamic-dynamic Furman ratio’) only reaches 2.40 in our benchmark case, between the conservative case for all households and the conservative case for full-time households in Table 1. Since the capital stock increases as a result of the corporate profit tax rate cut, the long-run revenue loss is less than the short-run revenue loss (which is calculated at the historically given capital stock). Indeed, if the economy is on the wrong side of the corporate profit tax Laffer curve (which is more likely the higher the elasticity of substitution between labour and capital and the higher the marginal tax rate), the long-run impact of a corporate profit tax rate cut on corporate profit tax receipts could be positive. But, this is empirically highly unlikely. where t is the constant corporate profit tax rate. Note that this is independent of the production technology, the real interest rate, etc. It depends only on the corporate tax rate. The assumption that produces this most simple expression is that the we evaluate the long-run gain in labour income at the (historically given) initial capital stock. That is fine if we are considering a very small cut in the tax rate but not if we change it from 35% to 20%. Here a stands for the elasticity of output with respect to the capital stock (the competitive share of capital income in value added) and s for the elasticity of substitution between labour and capital. It follows that the dynamic-static Furman ratio equals 1.54 when evaluated at t = 0.35 and 1.25 when evaluated at t = 0.20. Both numbers are well below 2.22, the lowest number in Table 1 (the conservative case for full-time households). For the special case of the Cobb-Douglas production function where capital’s share of output is equal to 40%, and the elasticity of substitution is 1, the dynamic-dynamic Furman ratio is equal to about 2.40 when the corporate tax is equal to 35% and to about 1.5 when the corporate tax is equal to about 20%. A decrease in the corporate tax rate from 35% to 20% is therefore associated with a ratio of the increase in long-run wage income to the decrease in long-run corporate tax revenue of between about 1.5 and 2.40. Clearly even these dynamic-dynamic Furman ratio numbers are lower than all but the most conservative in Table 1, and far lower than those of the optimistic scenario. The ‘dynamic-dynamic’ numbers are sensitive to the value of the elasticity of substitution, particularly for high tax rates. Even if the elasticity of substitution were as high as 1.25 and capital’s share of output were about 40%, the dynamic-dynamic Furman ratio ranges from 2.4 to 3.69, still much lower than the even the lowest figure supported by the optimistic case. If there is partial or complete expensing (that is, deductibility) of capital expenditure from the corporate tax base, then the scenario may be even less rosy for the effects of a cut in the corporate profit tax rate. Prior to the December 2017 reforms, 50% of capital expenditure could be expensed in the first year; following the reform that number is 100% (for the next five years). With investment expensing, the cost of capital is less sensitive to the corporate tax rate than if there were no expensing. Thus, the capital-labour ratio and the real wage are less sensitive, as well. If all capital expenditure can be deducted, then the cost of capital, the real wage and the capital-labour ratio are insensitive to corporate tax rate. For a Cobb-Douglas production function, if there is full expensing of capital expenditures then there is a greater proportional response of corporate tax revenue to a cut in the tax rate than there would be with no expensing. The move from 50% first-year expensing to 100% expensing itself of course boosts capital formation as long as the corporate profit tax rate is positive. Once there is full expensing of capital expenditure (and no expensing of interest), corporate profit tax cuts don’t affect the cost of capital or the incentive to invest. If there is full expensing of capital expenditure and deductibility (complete or partial) of interest from the corporate tax base, and if capital expenditure is at least in part funded by borrowing, a cut in the corporate profit tax rate reduces the benefit of interest deductibility and, thus, has the perverse effect of increasing the cost of capital. Hence a corporate profit tax cut would raise the cost of capital and lower the capital-labour ratio and the real wage as well. A reduction in the deductibility of interest, like the one included in the December 2017 tax reform, increases the cost of capital and therefore hurts capital formation, as long as the interest rate and the corporate tax rate are positive and the amount of borrowing increases with the capital stock. When the real interest rate is endogenised using a simple overlapping generations model, the impact of the corporate tax cut on household demand and/or on exhaustive public spending matters. An increase in the firms’ demand for capital brought about by a decrease in the corporate tax rate requires that the interest rate adjust to restore equality between the firm’s demand for capital and households’ and government’s supply of capital. A balanced budget cut in the corporate tax rate, with a lump-sum tax on households balancing the corporate tax cut, will, if there is no full expensing of investment, raise both the capital-labour ratio and the real interest rate. This reduces the long-run US real wage gains relative to the constant real interest rate benchmark. The intuition behind this result is that a corporate tax cut will not only impact the optimal capital stock through the incentive to invest, it will also in general impact household consumption demand or government demand. When the corporate tax cut is funded through an increase in (lump-sum) taxes on households, consumption demand will, if households are permanent-income-consumers, be boosted at a given interest rate and capital-labour ratio. This requires a higher real interest rate to re-equilibrate demand and supply. A sufficiently large share of ‘Keynesian’ households without access to financial markets can reverse that result. When the corporate profit tax cut is funded through a cut in public consumption expenditure, the aggregate demand effect (holding constant the interest rate and the capital-labour ratio) can go either way: up if the households’ marginal propensity to consume out of a permanent profit tax cut is greater than 1, down if it is less than 1. As noted earlier, if there is full expensing of capital expenditure and no expensing of interest, a cut in the corporate tax rate has no impact on the incentive to invest, and therefore no impact on the capital stock and real wage income if the real interest rate is exogenous. If the real interest rate is endogenous, the impact of the corporate profit tax cut on consumption demand (and possibly also on exhaustive public spending) will determine its effect on the long-run capital-labour ratio and real interest rate. A balanced-budget corporate tax cut/lump-sum tax increase leads to a reduction in the long-run capital-labour ratio and a higher real interest rate when there is full deductibility of capital expenditure. Again, with enough ‘Keynesian’ households, the impact on the capital-labour ratio can be positive. If cuts in exhaustive public spending balance the corporate profit tax cut, the impact on aggregate demand and thus on the capital-labour ratio is negative if the households’ marginal propensity to consume out of a permanent profit tax cut is greater than 1. The familiar proposition that a cut in the corporate profit tax rate boosts the capital intensity of production and the real wage is sensitive to a number of key assumptions. Even when the real interest rate is exogenously given, full deductibility of capital expenditure from the corporate profit tax base and no interest deductibility will result in no impact of a corporate profit tax rate cut on the incentive to invest. Adding deductibility of interest can result in a negative effect on the incentive to invest of a corporate profit tax rate cut. When the real interest rate is endogenous, effects of the corporate profit tax cut working through private and/or public consumption demand will reduce (boost) the positive impact on capital intensity if, at given real wages and real interest rates, the corporate tax cut boosts (weakens) aggregate private and public consumption demand. Author’s note: The views and opinions expressed are those of the authors alone. They cannot be taken to represent the views and opinions of Citigroup or of any other organization the authors are affiliated with. This column formalises and further develops ideas from the Citigroup publication: “Corporate Profit Tax Cuts, Capital Deepening and Real Wages: Hassett v. Summers - who is right? ", Citi, Citi Research, Multi-Asset, Global, Global Economics View, 22 November 2017, https://www.citivelocity.com/t/eppublic/1DCMe, by Willem H. Buiter. Buiter, W H (2017), "Corporate Profit Tax Cuts, Capital Deepening and Real Wages: Hassett v. Summers - who is right? ", Citi, Citi Research, Multi-Asset, Global, Global Economics View, 22 November. .
Buiter, W H and A C Sibert (2018), “Corporate Profit Taxes, Capital Expenditure and Real Wages: The analytics behind a contentious debate”, 8 May. Committee for a Responsible Federal Budget (2017), “How much will Trump’s Tax Plan Cost?” April. Council of Economic Advisers (2017a), Corporate Tax Reform and Wages; Theory and Evidence, October. Council on Economic Advisers (2017b), The Growth Effects of Corporate Tax Reform and Implications for Wages, October. Furman, J (2017), “Can Tax Reform Get Us to 3 Percent Growth”. Hassett, K (2017), “Prepared Remarks by Council of Economic Advisers Chairman Kevin Hassett Before The Tax Policy Center-Tax Foundation”, 5 October. Hodge, S A (2017), “The Economic Effects of Adopting the Corporate Tax Rates of the OECD, the UK, and Canada”, Tax Foundation, Fiscal Fact477, August. Joint Committee on Taxation (2017) “Estimated Revenue Effects Of The “Tax Cuts And Jobs Act,” As Ordered Reported By The Committee On Finance On November 16, ), JCX-59-17,2017, 17 November. Mankiw, G (2017a), “An Exercise for My Readers”, Greg Mankiw’s Blog, 18 October. Mankiw, G (2017b), “The Dynamic Furman Ratio”, Greg Mankiw’s Blog, 24 October. Mulligan, C (2017a), “Furman and Summers Revoke Summers”, Casey Mulligan’s Blog, 18 October. 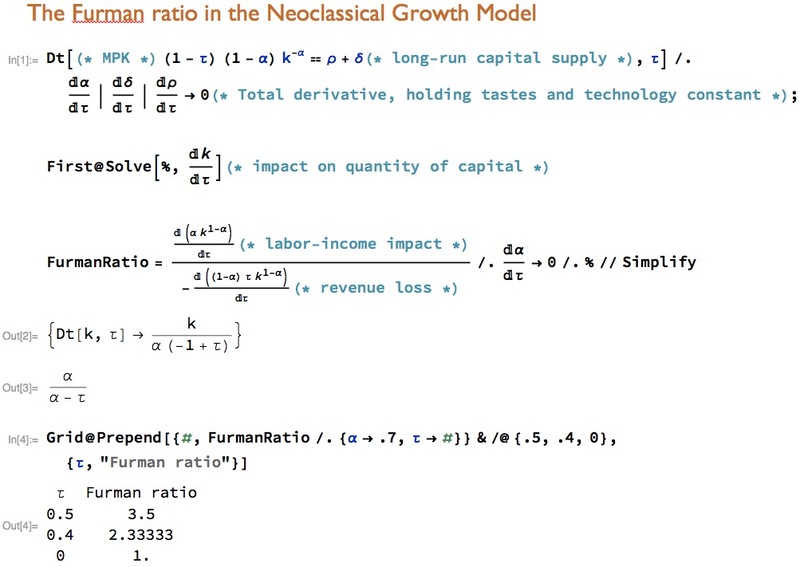 Mulligan, C (2017b), “The Furman ratio in the Neoclassical Growth Model”. Summers, L H (2017a), “Hassett’s flawed analysis of Trump tax plan”, 17 October. Summers, L H (2017b), “Lawrence Summers: Trump’s top economist’s tax analysis isn’t just wrong, it’s dishonest”, Wonkblog Perspectives, The Washington Post, 17 October. Tax Foundation (2017), Preliminary Details and Analysis of the Senate’s 2017 Tax Cuts and Jobs Act, Special Report No. 240, November. Tax Policy Center (2017), “Analysis of Tax Cuts and Jobs Act”, November. See also Mankiw (2017a, b, c), Mulligan (2017a, b), Summers (2017b, c) and Buiter (2017). “Labor Force Statistics” database, Bureau of Labor Statistics (https://bls.gov, accessed 27 April 2018), specifically Table A-9 Selected Employment Indicators. We use the average of the numbers from the Current Population Survey and the Current Employment Statistics survey. We assume a short-run revenue loss from the corporate profit tax cut of $200 billion.